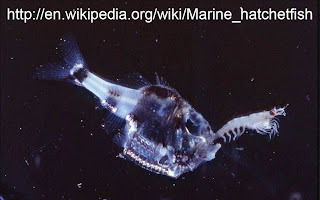 Sternoptychinae are a subfamily of deep sea bony fish which are commonly called hatchetfish. Their common name comes from the fact that their body is laterally flattened giving them the overall shape of a hatchet blade. I think it gives them a really spooky appearance. If their appearance doesn't convince you they are like ghosts, you should consider the fact that they can turn invisible. When they are being attacked by a predator they give of faint lights from their skin. That far under the surface most animals can only really see the difference in light caused by the shadow cast by certain objects. 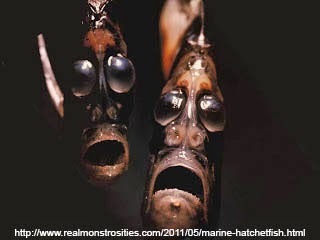 When hatchetfish glow at the same intensity as the light around them so they effectively have no shadow. This renders them invisible to many of their predators. Hatchetfish can be found across most of the worlds oceans at depths of 50 to 1500 meters. There are about 45 species in the subfamily. Their common name hatchetfish is also used for a completely different group of freshwater bony fish.